HomeDNA Reviews: Where Were Your Ancestors Shacking Up? Want to take a dip into the human gene pool? 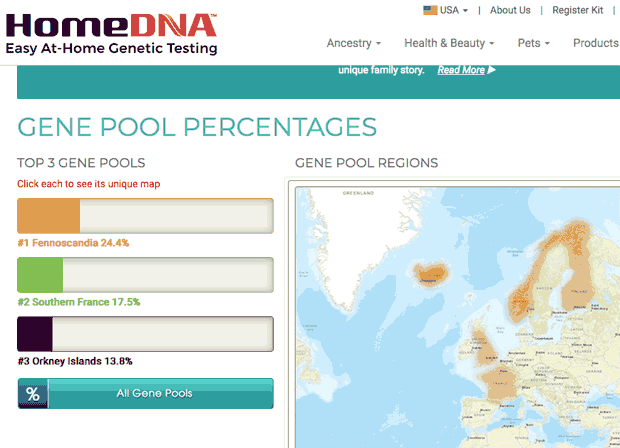 HomeDNA’s GPS Origins® test can tell you where you fit in with the 36 identified gene pools around the world. Is this at-home test worth it? Dive into our HomeDNA test reviews to find out. How Do Home DNA Tests Work? How Much Does HomeDNA Cost? Order the test kit on their website. Register your kit at HomeDNA.com using the barcode. Use the provided cheek swabs and mail them in the postage-paid envelope to HomeDNA’s lab. View your results online in 2-3 weeks. You can often save money off MSRP when buying HomeDNA on Amazon. Fall Special! Save $100 + Get Free Shipping on This DNA Test for ancestry! Use code: GPSCJ100, Get $10 Off + Free Shipping on Mixed Breed Identification DNA Test and Life Plan! Use code: MIXB18 and Get $20 off + Free Shipping on This Healthy Weight DNA Test! Use code: DNA20HW. Just use this link to get started. Michelle, one of our team members, had the opportunity to try this test out for free in exchange for an honest review. After so many stories and interesting results from friends, I finally decided last month to take the plunge and dig into my ancestry with a DNA test. Both my mom and dad have done some family tree research using various tools, including Ancestry.com, to build out the respective sides of their family trees. So while I was waiting for my DNA test results, I made some inquiries to see what I might expect to find. My mom’s family came over from the UK 200+ years ago and our Anglo-Saxon family name Dudley has strong origins in central England. We have also found some family tracing back to Scotland on the Dudley side. Since being in the U.S., this side of my family has strong origins in what is now the Virginia Beach area as well as just down the coast near Elizabeth City, NC. Interestingly enough, I grew up in central Virginia and now live in the Piedmont region of North Carolina. On my dad’s side, the lineage is a very similar storyline. The majority of the family for as far back as we have been able to research (late 1800’s) have lived in Virginia or North Carolina. My great-grandfather on my dad’s side was an orphan and there are no records of his parents, so that makes it more difficult to trace with much certainty before that. Some family history traces one of the prior generations to a Confederate soldier who was killed at Gettysburg. The Hundley family name from this half of my family also leads back to England but also traces back to having migrated from France after the Norman Conquest in 1066. What Was My GPS Origins DNA Test Like? In mid-February, I logged onto HomeDNA’s website to create my account. I ordered my GPS Origins Ancestry DNA test last month. It came quickly by mail, arriving about 5 days later. It was a pretty basic looking tri-fold mailer. I opened it all quickly and got started. Watch this video to see how the DNA collection and mailing process went for me. What Were My DNA Test Results? I waited 3.5 weeks for the company to process, analyze and prepare my results. The results were fascinating and more or less confirmed what I already knew, my family is largely from the UK but the largest portion was a bit of a surprise with 24% of my DNA showing ancestry tracing back to Scandinavia! As it turns out, many Scandinavians migrated to the UK over time so this matched up, although a little indirectly. The second largest portion was Southern France at 17.5% and then came the UK with 14% of my DNA indicating traces back to the Orkney Islands which are off the coast of Scotland. Both the UK and France now make a lot of sense, given my new understanding of my family tree and family name origins. While nearly 20% Russian/Siberian was unexpected, the biggest surprise for this uber white girl was finding out that I am more than 10% Indian, as in from India! I am a yogi and follow much of the mindfulness and spiritual beliefs of this culture, so I was thrilled to discover this lineage, even if it is remote. I Recommend Taking a HomeDNA Test! This was such a fun informational journey for me, but it also restarted the conversation among my direct family about our genealogy and where we came from! It has been a fascinating discussion to build upon the research that had already been done and in some cases, to raise a little controversy. My mom, who has done some pretty extensive family tree research, was rather astonished that England was not the highest percentage in my DNA test! I would recommend a DNA test for anyone who is interested in learning more about their ancestry but also for those who are starting down the rabbit hole of connecting the dot to the more direct ancestors from their personal family tree. What’s Our Final Verdict on HomeDNA? HomeDNA’s GPS Origins test gives you a fascinating look into where your ancestors came from and migrated over thousands of years. Their test kit could be worthwhile if you have money to burn, but $199 is a hefty fee for a test that doesn’t connect you with relatives or help you trace individual ancestors. Perhaps a wiser option is to take another company’s test and then upload your raw DNA results to HomeDNA for $39 if you haven’t already tested with one of the companies they accept. 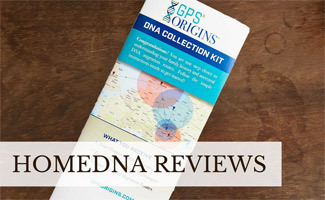 Be sure to check out our overall review where we compare ancestry DNA tests to learn more about 23andMe, AncestryDNA, Family Tree DNA and more. What are you hoping to find from a DNA test?